Bee Flies (Family Bombyliidae) are very common right about now. These fat-bodied bee mimics are very hairy and have a stiff-looking proboscis, but are true flies (having only 2 wings). They get a measure of protection by looking like bees, and even hovering and buzzing like them on occasion, but cannot sting. They are are very good pollinators in their own right though as well. One of the most common and widespread (being found in Europe and Asia as well as most of North America) is the Greater Bee Fly. It is sometimes also called the Large, or Black-tailed Bee Fly. The dark patches on their wings are usually good field marks for identifying them. They can be extremely common along woodland edges and wherever there are spring wildflowers. I think it is ironic that bee flies are bee mimics. Many of them, including the one pictured, are parasatoids of solitary mining bees (mostly in the genus Andrena). They lay their eggs at the entrance of the mother bee's tunnel, sometimes even flicking the eggs deftly down the hole itself. The hatching maggots eats the bee larvae and then the food stores that the mother had provided. So they not only look like bees, but feed on them and their food provisions when they are young as well. So next time you think you see a bee this time of year, take a second look. It might actually be a bee fly, looking for food for itself or a bee hole for its young. Eastern Redbud rescued from construction and now decorating my yard. Eastern Redbud (Cercis canadensis), a small native tree currently in bloom, is sometimes also called the Judas Tree or Flowering Judas. Part of the legend behind this name and this lovely native goes back to Christian folklore. The mythology surrounding all Redbuds originally dealt with a species in the same Genus found in Judea and various other parts of the Middle East that is also called the Judas Tree, Cercis siliquastrum. The legend says that originally all Redbuds were tall, strong and stately trees that bore beautiful white flowers. However, when Judas Iscariot betrayed Jesus and committed suicide by hanging himself, the tree he chose to use was the Redbud. The tree was so ashamed of the role it played that forever more it would not grow big or strong enough to be used for hanging. The wood from then on would be brittle and the flowers, no longer pure, lost their white color and blushed instead. Thus we get the alternate name for Redbuds: the Judas Tree, the tree he chose for his death. Probably closer to the truth was that this tree grew throughout Judea and thus was called "Judea's Tree" which was changed somewhere along the line to just being referred to as Judas Tree. Regardless, this native is commonly used in landscaping and is in peak bloom right about now. The flowers are unusual in that they may often grow straight from the trunk of the tree, a trait more common in tropical tree species called "cauliflory." Cauliflory: flowering from the trunk or main branches of a tree. 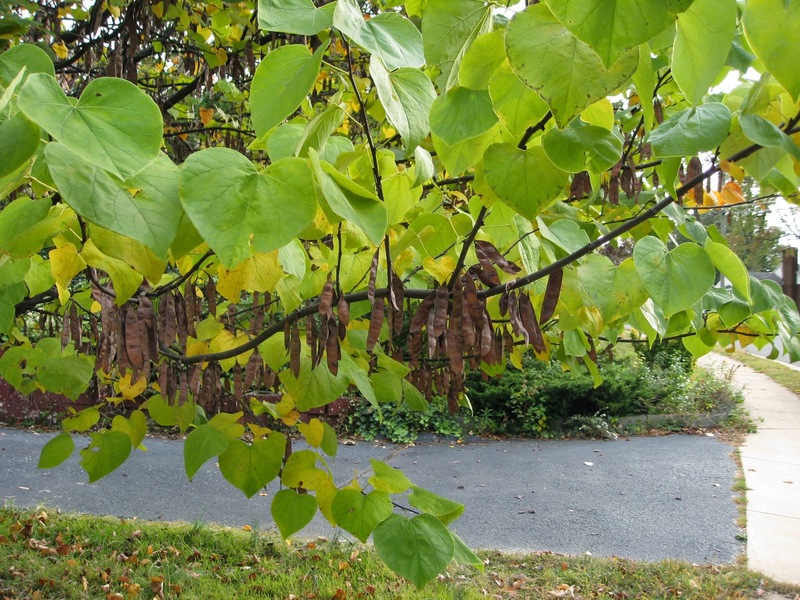 Redbud seed pods and heart shaped leaves. Leafcutter bee holes in the heart-shaped leaves. These flowers (and the young pods they turn into) are edible and have been added to salads to add color and some slight sweetness. I know my son likes to nibble on them, as do I. Leafcutter bees also seem to prefer them, leaving neat little cuts in the heart-shaped leaves. In fact, 19 species of caterpillars have been documented feeding on Redbuds, including the Henry's Elfin Butterfly. At least 13 leafhoppers and 6 beetles also find them good to eat. Redbud with lots of hanging seed pods in winter. The seed pods are the typical bean-like ones of legumes. They may hang on the tree well into winter, but are not a favored food by too many creatures, though birds will consume them. The foliage turns yellow in the Fall. The tree is rather short-lived, reaching 75 years or so and produces flowers often by their 4th or 5th year. Judas Tree changing into its yellow Fall color. People found more uses for them than the animals it seems. The indigenous people in particular found medicinal functions for this small tree. The Alabama used a cold infusion of the roots to treat both fevers and congestion. The Cherokee used it to treat coughs. Both the Delaware and Oklahoma used its roots to treat fever, but also as a purgative to induce vomiting. Many tribes of course also found the flowers and young pods tasty. Others derived a red dye from the roots. Now Redbuds are standards in landscapes due to their beauty. Fittingly, it is the state tree of Oklahoma. My wife and I rescued an Eastern Redbud from construction years ago and are now rewarded with a beautiful tree in our yard. Not only does it provide a gorgeous site when in full bloom, but it is covered with pollinators. If you take an even closer look, each individual flower looks like a miniature hummingbird. Such great rewards for a crooked little tree that was originally doomed by construction, until my wife and I took pity on it. 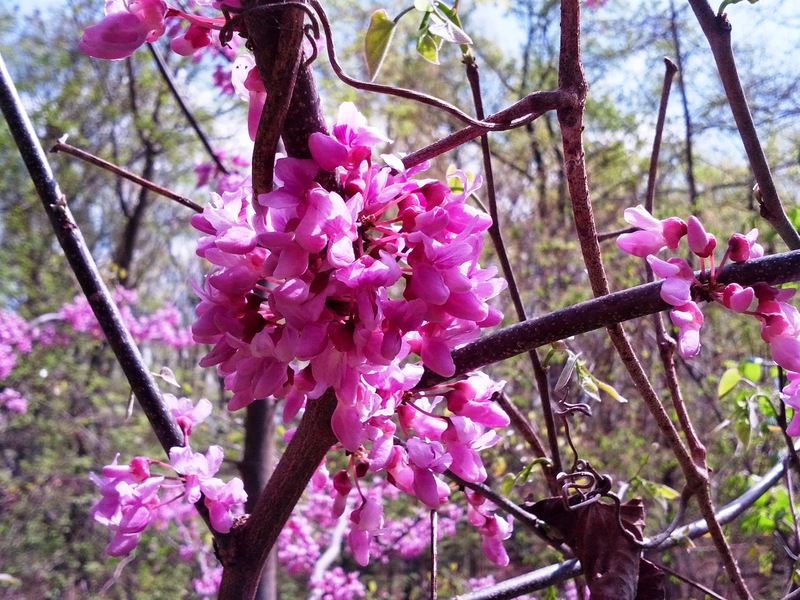 Whether others call it Redbud, Judas Tree, or Judea's Tree, we just call it ours, although all the animals and people who enjoy it might think otherwise. 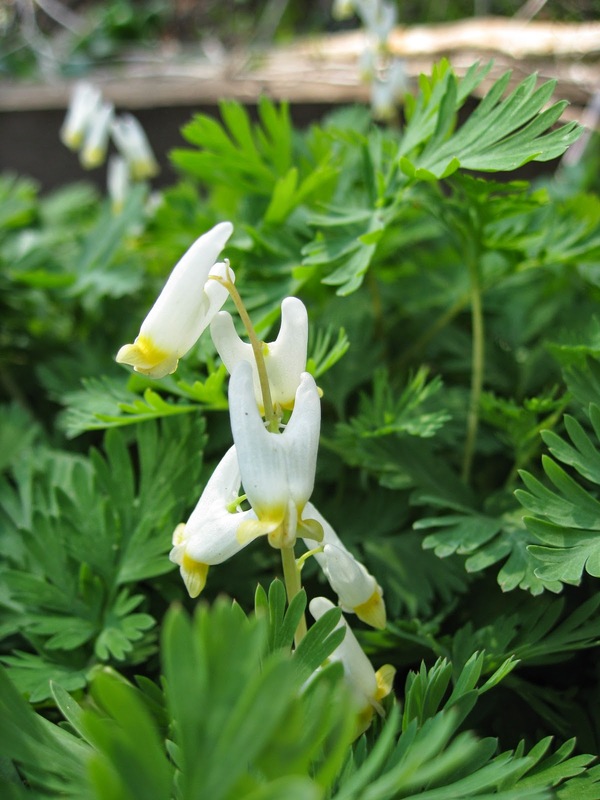 We have two local spring wildflowers that are very similar: Dutchman's Breeches Dicentra cucullaria and Squirrel Corn Dicentra canadensis. This makes sense as they are after all in the same genus, the name referring to their flowers having 2 spurs. Both are spring ephemerals (blooming and reproducing before the trees completely leaf out, then going dormant underground). Both have toxic leaves (another name for both is "Lambkill") that protect them from many herbivores. Both are myrmecochorous, having their seeds dispersed by ants. Both are primarily pollinated by long-tongued bees like bumblebees, have white flowers, and very similar leaves. Both like to grow in moist, often riparian woodlands as well. They also have some differences however that are apparent, particularly when they are in flower. Dutchman's Breeches are the more common of the two and they also tend to bloom a week or two earlier. Their most common name comes from the flowers resembling pantaloons hanging out to dry.These plants tend to form small colonies. They usually have two compound leaves per flower stem that are longer than their look-alike cousin..
Squirrel Corn is less commonly seen and tends to bloom a week or two later. Their most common name is derived from their yellow clusters of bulblets just below the soil surface. They are also called White Bleeding Hearts, and the heart-like flowers are the most obvious difference between them and Dutchman's Breeches. They also normally have only one, shorter compound leaf per flower stem. Both these flowers are open right now, their bloom times briefly overlapping this year. Go check out their differences in person. But hurry, or you will have to wait another year before they emerge and flower again. An interesting symbiotic relationship exists where approximately 5% of the world's plants have evolved specialized seed attachments that attract certain species of ants to disperse their seeds. About 11, 000 species of plants grow these specialized fleshy structures, rich in lipids and proteins (and sometimes producing ant attracting pheromones) called elaisomes. The ants usually take the seeds back to their nests where the elaisome is consumed but the seeds are discarded, often inside the nests' nutrient rich waste dumps where they are protected from predators (or fires) and finds it easier to germinate. This goes by the name of myrmecochory. Our region is especially rich in these species of myrmecochorous plants, with approximately 30% of our spring wildflowers having evolved this way. This occurs in over 90 species in 25 families in the DC area, although not all of them are native. A partial list of plants includes: Trilliums, Hepaticas, Spring Beauties, Woodrushes, Troutlilies, Corydalis, Dutchman's Breeches, Squirrel Corn, Wild Bleeding Hearts, Twinleaf, Rue Anemone, Wild Licorice, Trailing Arbutus, Bloodroot, Wild Ginger, Greater Celandine, most Violets, Pansies, Speedwells, Snowdrops, Daffodils, Grape Hyacinths, Star-of-Bethlehem, Ground Ivy, Henbit, Deadnettle, some Iris, Sedges, Spurges, Bellworts, perhaps Bluebells (though I think they're really water dispersed) , and unfortunately some invasive Thistles and Knapweeds. So the next time you see some ants at your picnic or while out hiking, remember that they may be the reason you get to enjoy the spring wildflowers as well. Two early spring mints are commonly confused for each other in many of our yards. Both Purple Dead-nettle Lamium purpureum and Henbit Lamium amplexicaule can often be found growing right next to each other and share several similarities, which is not surprising since they are in the same genus. Both are annuals and well established non-natives originally from Eurasia. Both have square stems typical of mints, but lack the minty smell. Both bloom fairly early in the season and are usually less than a foot tall. Both also are considered edible, but I don't them find terribly appetizing myself (although the flowers from Purple Dead-nettle are slightly sweet if I could ever figure how to harvest enough of them). Henbit can usually be told apart from the other by its scalloped leaves that grow in whorls around the stem, the upper ones grasping it and appearing to be stalkless. The species name amplexicaule means "clasping the stem" and is very descriptive of this main way to tell identify this plant. Because they bloom so early and pollinators may not be available, they are able to self-pollinate as well. Purple Dead-nettles have their leaves in clumps, especially near the top, and have short stalks connecting the leaves to the stem. The leaves are often a purplish or dark color. The unusual name is derived in that these plants are thought by some to resemble nettles but are "non-stinging" and thus termed "dead." While often considered garden weeds and even invasive by some, these plants are well established and often grow in waste places where few other things thrive. They can be found growing from cracks in the sidewalk and may provide an early nectar source to the earliest pollinators, providing some early spring color in places few other plants can survive.